The straight upright rows of same-shaped gravestones look like they are located in a military graveyard—but they are not. 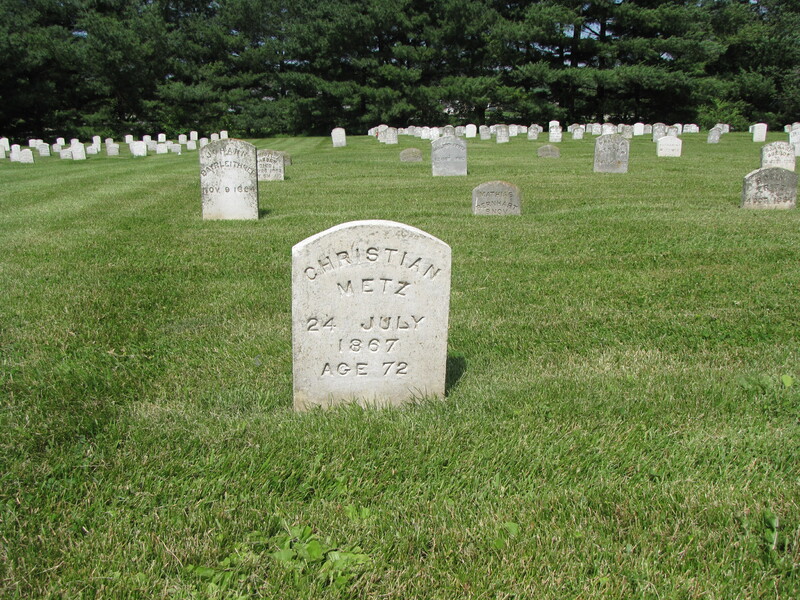 These gravestones are in a tiny graveyard at “Main” Amana, Iowa, one of the seven villages founded by a communal German religious group of Pietists known as the Community of True Inspiration. 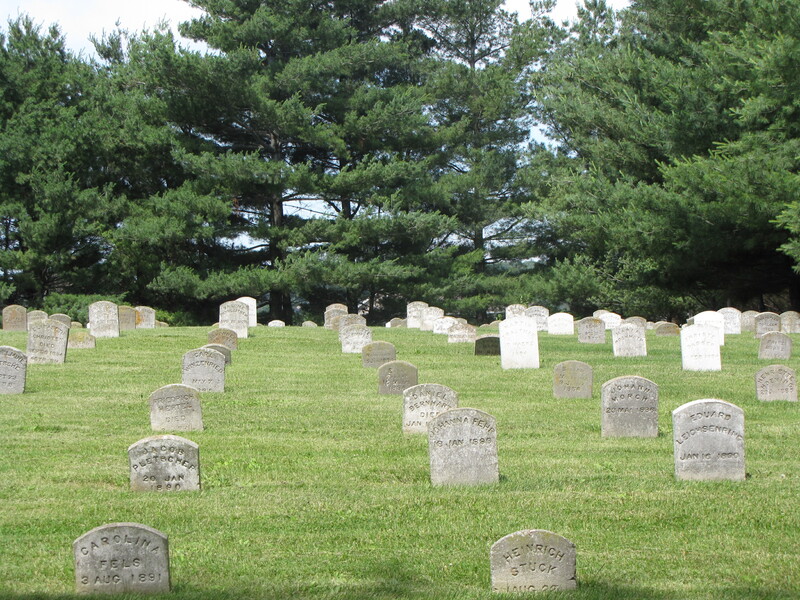 Each person is buried in order of their death–NOT next to their families in family plots. Each person receives a concrete segmented-top gravestone of the same shape and construction. In the early 1700s, two religious leaders, Eberhard Gruber and Johann Rock, founded the religion. They followed the teachings of Philipp Spener, who believed that God spoke directly to individuals, just as He had done in Biblical times through the prophets. The Inspirationalists, as they were called, were being persecuted in Germany for disavowing the teachings of the Lutheran Church. Their property was seized and some of the members of the religious group were flogged. After Gruber and Rock died, Christian Metz and Barbara Heinemann were named instruments, those who could hear the word of God directly. After leasing land in Europe for two different settlements, they decided, in a meeting of elders to move the colony to America. In 1842, the Inspirationalists moved to a settlement in New York, which they called Ebenezer after the Eben-Ezer found in the Book of Samuel. The community prospered and they required more land. It was decided to move west. The purchased a parcel of land in Iowa and, in 1855, established the first village of Amana. Amana is a Biblical name meaning inspirational. Six more villages came after: Homestead (a village the Inspiralistionists purchased for the railway station), Amana vor der Hohe (High Amana), Sud Amana (South Amana), West Amana, Ost Amana (East Amana), and Mittel Amana (Middle Amana). In total the Amana Colonies had 26,000 acres of land in what is some of the best farmland in the breadbasket of America. These villages and this land were held in common by the community. Each member of the community was expected to work, go to several of the church services during the week, and eat together in the communal dining rooms. Each of the seven villages had communal kitchen to supply the meals—cooking was not done in individual homes. However, dining together was not considered a social act and talking was discouraged during meals. Men sat on one side of the table and women and children on the other. Likewise, church services were austere—men on one side of the church and women on the other, with small children and women in the back. These services had no music. Marriage was discouraged but allowed if the religious leaders could find no objection to the union. Children were also discouraged. In 1932, the community went through what is known as the “Great Change.” That is, the community was disbanded and members of the community were awarded shares of stock based on how much they had invested in the community. That year communal life ended. However, the seven villages still remain as does the reputation of one of their best-known products—the Amana refrigerator, which is now owned by the Whirlpool Corporation.